Chefs looking to update their sandwich offering need look no further than the latest addition to the Young’s Foodservice range, the Crispy Fish Fillet Burger. The crispy fried fish fillet burger is made from Wild Alaska Pollock coated in a signature bubbly batter provides a moreish combination that can be cooked to perfection from frozen by oven baking for 25 minutes, or deep frying for 8 minutes. As the burger boom continues to grow, operators who want to capitalise on the nation’s love of burgers must keep up with new trends and really pay close attention to the finer details that bring the finished dish together. Burgers work particularly well within grab and go outlets because they are accessible for eating on the move and offer the perfect middle ground for lunch, dinner and even a snack. They appeal to a wide demographic, can offer seasonal versatility and are easily adapted to suit every customer’s preference with additional toppings and flavours. However, with 28% of Brits seeking to reduce their red meat consumption due to health, environmental or animal welfare concerns*, it is important operators offer alternative proteins if they want to appeal to needs of all customers and stand out from the competition with a more varied offering. 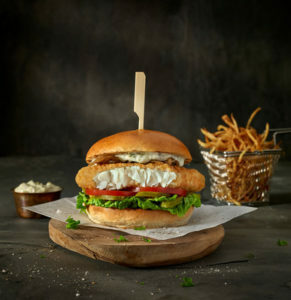 The new Crispy Fish Fillet Burger from Young’s Foodservice is a fantastic alternative to beef and chicken burgers. 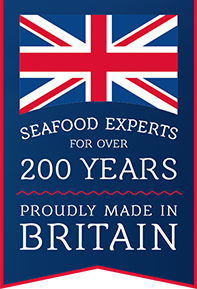 MSC certified and free from artificial colours and preservatives, the Fishwich will attract many who are looking for a more nutritious solution, whilst reducing their red meat intake. Keep things simple and offer a taste of summer by layering the Crispy Fish Fillet Burger with lettuce, pickles and a generous helping of herby mayonnaise or try an Asian inspired treat with zesty lime, fiery red chilli and pickled cucumbers. The Crispy Fish Fillet Burger is the perfect size and shape for packing into all kinds of carriers from toasted ciabatta buns to fluffy brioche.